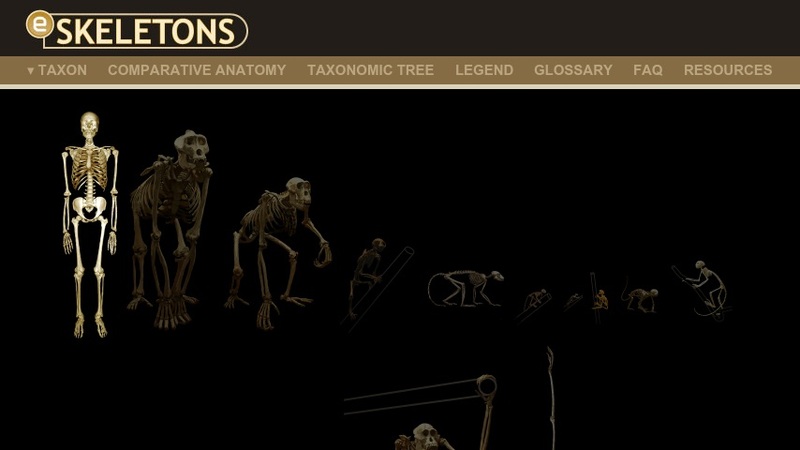 The eSkeletons web site feature a unique set of digitized versions of skeletons in 2D and 3D, animations, and supplemental information. It allows users to see and compare bones from the skeleta of humans, gorillas, chimpanzees, and several other types of primates. Users can navigate through regions of the skeleton and view all orientations of each element, along with muscle and joint information; select overlays depicting major muscle origins and insertions; and compare the selected bone with the same bone from another primate. Other features include labeling of muscles, articulations, and morphological features, a measurement tool, animations, and virtual reality models of selected bones.